A charming daily comic strip. Contains a profound knowledge of cats. Obtained this after a month-long wait from Better World Book and it is totally worth it. Free shipping worldwide with cheap reasonable price plus you also help raising funds for literacy and libraries around the globe. So, if you don't mind buying used books, definitely go check them out if you haven't yet.On book : When it comes to Patrick McDonnell works or Mutts series I always ALWAYS love it. I love the characters so much, the messages, the simplicity of the drawing. All of it. Excellent as always. Read some more of Mooch and Earl's adventures.Who Let the Cat Out? had adventures in trying to hibernate, Mooch and Earl visiting a restaurant, how Mooch would teach subjects in school, and a number of one-shots. 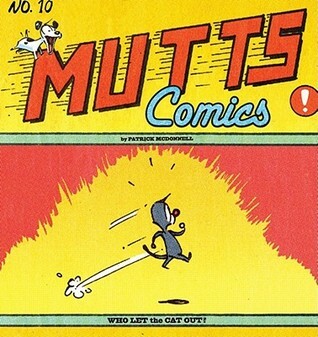 A collection of the newspaper strip, this edition of Mutts was as enjoyable as ever. I did notice a few times where McDonnell was coasting on old jokes ("No, but if you hum a few notes..." type jokes repeated a couple of times) and what I would consider an ill-advised foray into pop culture (American Idol....really?) but all-in-all a good collection.As usual you get some of McDonnell's social messages (sometimes a little heavy handed) and a neat look at the world through the eyes of some friendly animals.If you are a fan, you already have it. If not, it is a good place to join the series. A year's worth of this wonderful cartoon featuring Earl the small dog and his friend Mooch the cat, plus their owners/companions and other friends. the dailies and Sundays, but all in black-and-whiteHighly recommended.